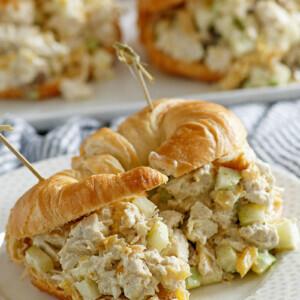 A delicious chicken salad tucked into a croissant. In a medium bowl, stir the mayonnaise, orange juice, curry powder, and salt until well blended. Gently stir in the chicken, apples, pineapple, raisins, and chutney until well coated. If making ahead, cover and chill up to 12 hours. To serve, stir the mixture and mound the filling in-between croissant halves.